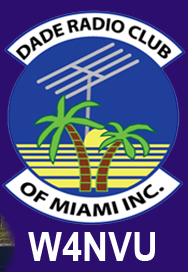 May 2010 Meeting Minutes – W4NVU – Dade Radio Club of Miami Inc.
Meeting was called to order at 20:02 with 13 present. Ernesto presided over the meeting and welcomed everyone. The meeting was broadcast live on the air tonight from the EOC. Testing is being done in the other room. The microphone was passed around the room and everyone took turns and stated their name and call sign. Ernesto welcomed everyone again. We have a quorum. Jason brought in a guest speaker. His brother, Dr. Scott Bunch. He is a scientist. Due to technical difficulties, the minutes have not been posted for several months. It was discussed that Jason will post them for us. Esther motioned to have the minutes posted by the next meeting and then we can vote to approve them then, seconded by Robert. A vote was taken and the motion passed. Ernesto spoke about the MS150 that took place April 17. It rained out on Sunday. They used an emergency plan and moved everyone out by busses and tractor trailers. They took in approximately $1.5 million so far. Next year Ernesto will be working to coordinate with motorcycles to use them instead of SAG. SAG means support and gear. We will need more Hams next year. All started and finished this year together. The rest stops had Hams. The turnout was fantastic. Field Day was discussed next. Philipe was not present tonight. It is supposed to be June 26/27. We can discuss it at the next meeting. We need to get a site. Ernesto will get in touch with Philipe. Several sites were discussed. Ernesto suggested that we set-up with all our equipment a day before hurricane season to test the equipment. An announcement will be made on South Florida Hams. Carl will look into it. Carl spoke about the 444.200. It’s working. It is off frequency a little bit, and will be worked on soon. Robert spoke about the 220.000 – It’s not working. Looking for a new home. He is going to try to coordinate with John Vecchio to see what can be done. Merritt was not present to speak about the 147.000. Mike advised that he was having a problem on Miami Beach. Ernesto advised that we do not have easy access to the repeater and he is working on a lease agreement. Any tower work has to be done professionally. There are problems and we are working on it. Ray advised that about 2 weeks ago, all the major trustees of repeaters met and it went well. It was discussed that we need new sites preferably on a real tall building. If anyone knows the chiefs of engineers of tall buildings, maybe we can approach them. Ernesto stated that on Brickell there is a building that already has a repeater on it and he is still working on it to see if we can also put our repeater on that building too. The frequencies will not interfere. Regarding the trailer, Ernesto went by John and Merritt’s shop but no one was there. He will see if he can get some update for us by the next meeting. Carl advised that the EOC had a hurricane exercise drill. It went well. They were training on new computer software. Carl will look into it if we can train to work on the computers for a hurricane or other emergency. Carl also advised that the pit was updated with all new equipment. He said that we will have our next meeting in that room if possible next month. Andy came in from testing and announced that we only had one upgrade to extra tonight. Mike asked if we were having a Hamfest this year. The answer was no. We were $3,000.00 in the hole last year and didn’t make any money. It was the lowest turnout and with the vendors not coming down, the event is no longer in demand. Robert announced that he is in contact with someone at Jackson Hospital and that they want a Ham during the time of disaster for their radio room. They need someone that can dedicate their time. Let Robert know if you are interested. Esther announced that Miami Dade College Kendall Campus also has a radio room. They also need volunteers. She is going to speak to Harold and check it out and let us know at the next meeting. Virgil said that more and more people are interested in echolink and to have one setup on a repeater. Ernesto said that there is too much involved and it costs too much money. Dr. Bunch could not give his presentation as we could not get the equipment to work. Ernesto asked if there was any other business. With no other business, Ernesto thanked everyone for coming. A Motion to close the meeting was made by Joanne, seconded by Robert. Voted and passed. The DRC meeting was adjourned at 20:45.